Peterborough United manager Grant McCann refused to say bad luck was to blame for his side’s 1-0 defeat at League One promotion favourites Sheffield United today (September 17). 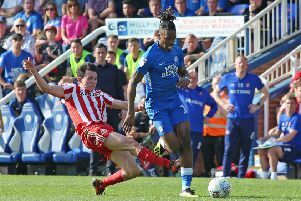 Posh saw plenty of the ball at Bramall Lane and put together some lovely passing movements, but they couldn’t find a finish. Deon Moore during his Football League debut for Posh at Sheffield United. Photo: Joe Dent/theposh.com. The defeat means Posh have taken just two points from their last three games. They slipped three places to ninth, but they are just five points off top spot in a very tight division. McCann bemoaned a poor start, some dodgy attacking decisions and a lack of ruthlessness for a loss against a side who were winning for the fourth game in a row. McCann said: “I don’t accept we were unlucky. When you start a game as poorly as we did against a good side you will get punished and that’s what happened. “We went on to play well without scoring which is obviously disappointing. We are moving the ball about well, we are dominating possession easily enough, but some of our decision-making going forward was poor. Jerome Binnom-Williams on the attack for Posh at Sheffield United. Photo: Joe Dent/theposh.com. “We had too many powerdpuff shots from 25-30 yards when we should have been taking another pass. We also weren’t ruthless enough which was a carry on from last weekend. “We had a bit more pressure on us today having not won either of our last two home games. If we had won those games like we should have done we could have come here and enjoyed it a bit more. It would have been like having a free game. “Having said all that we created two great chances. Paul Taylor’s poor touch cost us the chance of a goal in the first-half and Gwion Edwards should have scored when Deon Moore set him up in the second half. McCann made three changes to his starting line-up today. Two were forced with Jermaine Anderson’s injury and a suspension for Andrew Hughes, but Taylor started instead of Edwards. Leo Da Silva Lopes and Jerome Binnom-Williams replaced Anderson and Hughes respectively. McCann then made three substitutions just before the hour mark with Moore making a Football League debut. “Sheffield sat deep in the second-half which made it difficult for Deon, ” McCann added. “But he did okay. Jerome Binnom-Williams played okay considering how little football he’s played. “I felt I needed to give Gwion on a rest. I’m not sure it was the right decision because he gave us a lot of energy when he came on. “It’s been a disappointing day, a very frustrating day, but it’s also obvious we are not far off being where we want to be. We have some good footballers and a strong squad, but we do need to get the home form going next weekend. Posh host Walsall at the ABAX Stadium next Saturday (September 24). They became the first team to beat Bolton in a League One match this season today.